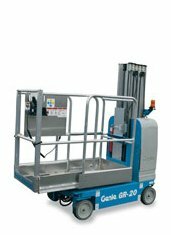 The GENIE GR20 vertical lift can help you reach objects at a height of up to 6.5 metres. The capacity of the lift, on the other hand, is rather impressive and can reach up to 227 kilograms. And, on top of all, the batteries are maintenance-free, so as a user you will not have to worry about anything.